England and Arsenal striker Dan Carter hopes to earn a place in the Lionesses squad for the European Championships after her "remarkable" debut on Monday. Carter, 22, scored a hat-trick as England thrashed Estonia 8-0 in Tallinn in their first Euro 2017 qualifier. "I'm still new, so I still need to prove stuff, besides just that performance," she told BBC Sport. "I just want to be selected for all of the games coming up and then ultimately be a part of the Euro 2017 squad." 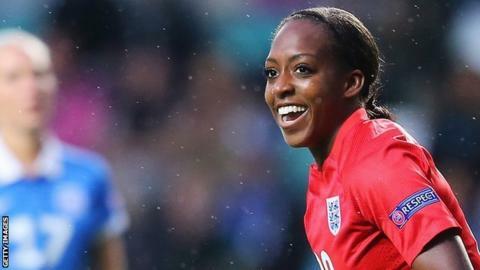 After the game, England boss Mark Sampson praised what he called a "very confident performance" from Carter, but did say that his side could be more "clinical" in the box. "I agree with what he said," Carter added. "It could have been double figures, but we are happy overall with the 8-0 win. Having netted twice in 12 league games for Arsenal Ladies so far this season, Dan Carter scored more times in one game for England on her senior international debut. "Whether it was a debut or not, to score for your country is an unbelievable feeling, but to do it on my debut and to score three was remarkable." Carter hopes to help the Gunners, who are third in the Women's Super League, in their bid for a top-two finish and European football next winter. They travel to fourth-placed Sunderland on Saturday in their penultimate league match of the season. "I'm definitely still buzzing from my debut," she added. "Now I've got to put that aside and focus on my club duties and hopefully take that confidence and that performance into my remaining two games with Arsenal. "Arsenal are expected to do big things and we haven't been in the Champions League for two years now. If we miss out again it will be very unfortunate. "We want to win both of our last two games, finish on a high, hold our heads up and say that we've done the best we can this season." Arsenal are three points behind second-placed Manchester City, and five points behind leaders Chelsea, with two matches remaining.